Everything and anything you can imagine is here at the Lady of the Lakes Renaissance Faire. There are Over 100 Entertainers in the lanes and across Seven Stages, from daring sword fights to jousting knights, from the musical sounds of the era to side-splitting comedy, be prepared to be entertained in the best way possible! Whether you are looking for laughs, thrills, or chills, we have it all! Check our Entertainment Schedule for a full listing of shows and showtimes. Come hear the folky, comical musical anecdotes of faire life. A self-proclaimed “Action Hero” of comedy, prepare to avert your eyes from the bullwhips, fires, straitjackets, chains and other perils that await Johnny Phoenix. Commedia dell'Arte has a new name. Get ready to laugh till it hurts. Ahoy mates! This band of pirates will have you laughing as the share musical stories from the seven seas! Lady Matilda, Lady Marion, Lady Mable, and Lady Martha sing stories of ale, drunken nights, love, lust, and marriage. Music, Comedy and Drinking. Also, Drinking. Resurrecting traditional tunes and belting out original ones, each a tribute to the old days of Ireland, oceans, and booze-fueled hilarity. A ragtag group of some of the most entertaining Irishmen (and woman!) the world has ever seen. Mischief-makers and ne’er-do-wells, celebrating celtic music and mirth. Teaching history with hilarity the dueling dames empower audience of all ages to learn sword skills, while becoming brave warriors against bullying. Relationship counseling specializing in sheepy antics. Learn what to do and what to avoid. Don't miss out and end up sleeping in the barn. Drawing on many sources, & speaking in the smoothest fast-patter around, this ‘medicine show’ with small routines of fortune telling, magic, & humor. The sounds of an era long past revived to a new musical toe-tapping adventure. The sounds of folk from Ireland and the British isles explode in rhythmic time. 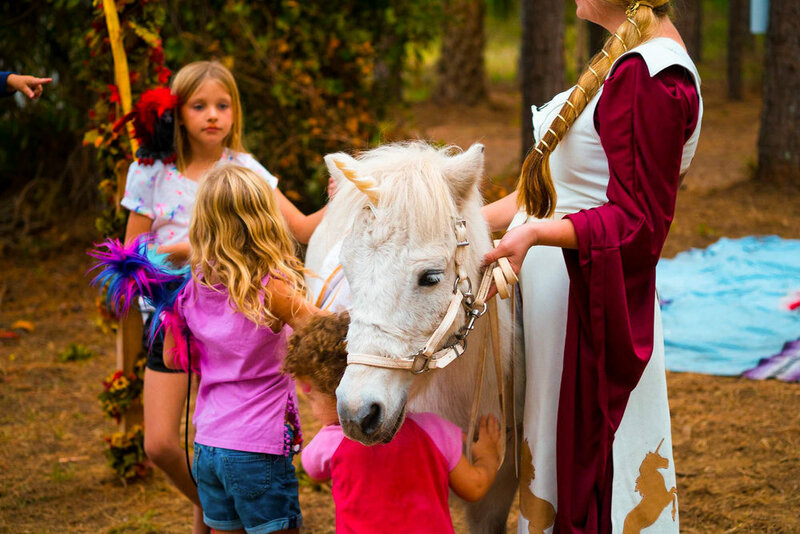 While the Lady of the Lakes Renaissance Faire features family friendly entertainment throughout the site we also have special entertainment with our younger princes and princesses in mind. Highlighting a few of the guest family favorites below, be sure to check out out entertainment schedule for all listings. This enchanting encounter will have you believing in fairies. Faires can be seen across the faire, but call the Fairy Grotto their home. Stop by for a truly magical experience the kids will love. Relax in our shaded glenn and listern to master storyteller, the Lady of the Lake herself, bring to life The Myth of the Lady of the Lake. Take a moment to enjoy the site and sounds of the forest and participate in this interactive adventure. Enchanting and majestic, this is a rare opportunity to see a real live unicorn at Unicorn Glen. Don't miss this exciting experience for the whole family! Huzzah! Cheer on the Noble Knights of Noble Cause as they engage in time honored traditions on the Joust Field. Witness the excitement as both Nobles and Scoundrels alike of the Rogues Theater engage in live human Combat Chess!